Across the world people want to live in cities that are greener, healthier and wilder, and where they can enjoy time outdoors. A National Park City is three things: a place, a vision and a community. It’s about people working together. We’re delighted you are interested in joining our conversation about the future of National Park Cities. 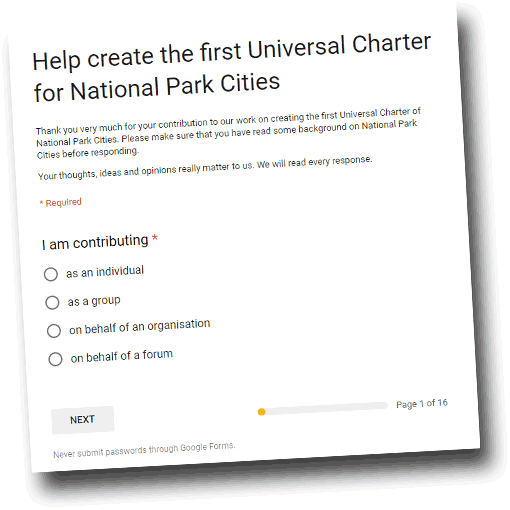 By contributing to this consultation you can help shape the first Universal Charter for National Park Cities. Informed by our experiences working to declare London a National Park City, this Universal Charter will give an overall, global identity to National Park Cities. It will inspire people as individuals, as part of their community, as members of groups and as people involved with larger organisations, to act collectively to improve life in cities as part of a wider movement. It will be designed so that anyone, may they be 8 or 80, can be involved. Some elements are fixed; other are flexible and adaptable so people can adapt it to their own lives, places and cities. The current draft arises from five years of grassroots campaigning in London and two international forums on the National Park City concept. One in London and a second in Adelaide, with further forums planned in the future. The first will be taking place at the end of February. To be updated on these please join our newsletter. This Universal Charter consultation will remain open until 5th May 2019. The first draft of the Universal Charter will be published in July 2019. Following the consultation, the first draft of the Universal Charter of National Park Cities will be drafted by a writing team and panel of advisors convened by the National Park City Foundation, World Urban Parks and Salzburg Global Seminar. Everyone who responds to this consultation will be invited to comment and, if they want, show their support for it. Learn more by reading our homepage on National Park Cities. Visit the London National Park City website and browse the city’s draft charter. Browse some media coverage. Read the full text of the consultation on the Universal Charter. Interact by joining a webinar at the end of April. Organise a forum to give a response on behalf of a group, community or organisation.